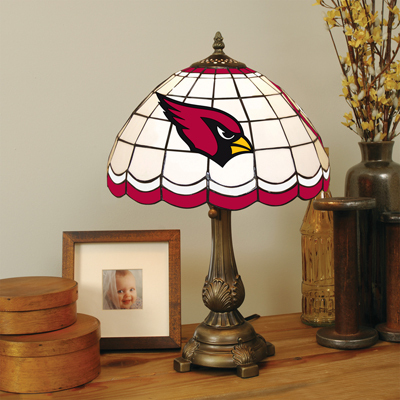 Light up any room in your home or office with the officially licensed Arizona Cardinals Tiffany-style glass lamp from The Memory Company®. The lamp features a hand-cut stained glass lamp shade with a cast metal base. The Tiffany-style glass table lamp features the authentic colors of the team along with the team logo. Add class and distinction to any room and show your team’s spirit though its warm glow. Requires a 60-watt bulb or less (Not Included). Measures 19.5” Tall by 12” Wide.